Diamond Museum Amsterdam is a one of a kind museum in the destination that gives you an opportunity to get a closer look into diamonds. The museum gives you a brief history of how diamonds are geologically formed. Visit the museum to know all about diamonds and you are sure to have a great time in this destination. The museum also explains you how diamonds came into existence and became a symbol of power and wealth. With the museum being solely dedicated to diamonds, it is hardly a surprise to see it as one of the top attractions among visitors in Amsterdam. The museum charges specific Diamond Museum Ticket Price as an entrance fee. Tickets for Diamond Museum is available in the premises with a little concession in the Diamond Museum Ticket Costs for children, students and seniors. No Diamond Museum Tickets are need for Children un 12. Diamond as a main theme, the place awes everyone who visits here. 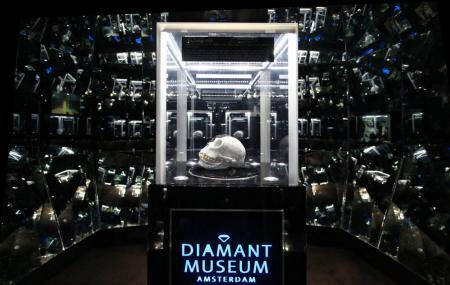 How popular is Diamond Museum Amsterdam? People normally club together EYE Film Institute Netherlands and Foam Fotografiemuseum Amsterdam while planning their visit to Diamond Museum Amsterdam. People also prefer to start their day with Diamond Museum Amsterdam.